The fourth focuses on the patent system works, i.e. how you scroll, rotate or translate a document with a touch screen. In its application, Apple makes next to descriptions of its patents and their translation to the same in the operation of Smartphone from Samsung. On his blog, Florian Mueller, an expert in intellectual property, following each episode of this series, explains that this attack is double edged. If successful, Samsung may have to remove its products at relatively short notice, by the re-entry in the best case (for Apple). But if Apple's request is not satisfied with, this will weaken his case. Mueller said that a court will not issue an injunction before a strong case and convincing. Apple's request does in fact only a few pieces of litigation brought against it to Samsung; the goal is probably easier to obtain a quick decision. Mueller also lists pending and they have accelerated this week alone. 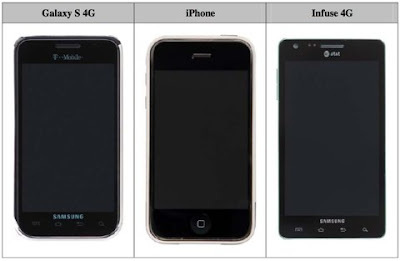 Samsung complaint Tuesday with the International Trade commission with the aim to ban the entry of the U.S. iPhone, iPad, iPod and supposedly violating the patents. Wednesday the same complaint was filed with the court of the state of Delaware. Wednesday, Samsung opened a front in England, which was preceded by Italy. Count Florian Mueller: "Samsung has now filed a complaint against Apple with eight courses in six countries on three continents”. Samsung has also increased from 15 to 17 the number of patents used in its complaints in the United States. On another front, the International Trade commission has determined that Apple had infringed two patents of graphics chip maker S3. For two, it has not been established that there was a violation. S3 had taken action with the ITC in June 2010, arguing that technology to encode, decode, compress, store and decompress graphics had been raped and used in all the materials Apple iPod touch, iPhone, iPad, Mac and also through the SDK to develop applications. This decision, says CNET, is preliminary; it will be confirmed or refuted in November by a committee. S3 for his part reiterated that his method of texture compression was licensed by Microsoft, Nintendo and Sony.